Prizes are redeemable on your next visit, and must be booked in advance. Can’t be used in conjunction with any other offer. The materials on ETM Group’s website are provided on an ‘as is’ basis. 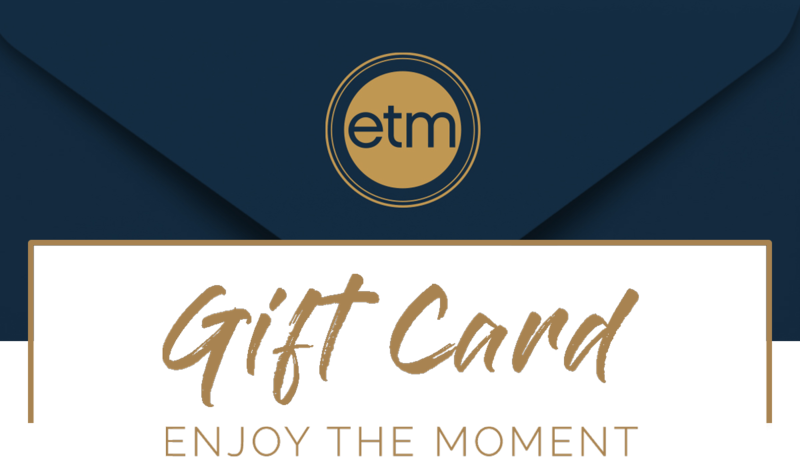 ETM Group makes no warranties, expressed or implied, and hereby disclaims and negates all other warranties including, without limitation, implied warranties or conditions of merchantability, fitness for a particular purpose, or non-infringement of intellectual property or other violation of rights. In no event shall ETM Group or its suppliers be liable for any damages (including, without limitation, damages for loss of data or profit, or due to business interruption) arising out of the use or inability to use the materials on ETM Group’s website, even if ETM Group or an ETM Group authorized representative has been notified orally or in writing of the possibility of such damage. Because some jurisdictions do not allow limitations on implied warranties, or limitations of liability for consequential or incidental damages, these limitations may not apply to you. ETM Group has not reviewed all of the sites linked to its website and is not responsible for the contents of any such linked site. The inclusion of any link does not imply endorsement by ETM Group of the site. Use of any such linked website is at the user’s own risk.